SkyLIGHT™ PVX as a Service is the subscription-based performance monitoring as a service solution (NPM/APM SaaS) that provides organizations with real-time visibility across networks and application chains: private, public, and hybrid cloud environments, virtualized infrastructure, and software-defined networks. SkyLIGHT PVX as a Service bundles the complete SkyLIGHT PVX wire data solution with a SkyLIGHT PVX-certified partner’s professional services know-how to provide the right level of tools—for any application chain, network type, or IT environment—and troubleshooting expertise. 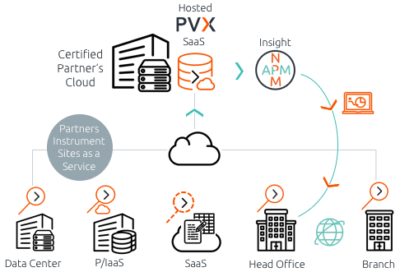 SkyLIGHT PVX as a Service —NPM as a service, APM as a Service—is delivered as a monthly subscription by Accedian-certified partners for time periods ranging from as little as one month to up to three years. Choose the service plan that best fits your organization’s business priorities and budget. SkyLIGHT PVX as a Service supports any size or type of network or application infrastructure, whether physical, virtualized, cloud-based (i.e., public, private, or hybrid), or software-defined network environments. With SkyLIGHT PVX as a Service, Accedian partners with SkyLIGHT PVX-certified service providers around the world to deliver SkyLIGHT PVX as a comprehensive, cost-effective, subscription-based service offering. SkyLIGHT PVX as a Service combines intelligent wire data analytics with rapid deployment, and expert analysis. Customized dashboards and automated email reports provides a powerful analytics platform that keeps IT teams in tune with their infrastructure, as it happens.